The government has set an ambitious target to have half a million electric vehicles (EVs) on the road by 2030. There are currently circa 3,000 electric vehicles in Ireland or 15 per cent of the 2020 target. Ireland set an initial target of converting 10 per cent of the passenger and light commercial vehicle stock to electric vehicles (EVs) by 2020 (equivalent to 230,000 vehicles). In 2014, the lower than anticipated uptake of EVs led to a downward revision of this target to 50,000 by 2020. In 2017, the target was lowered further to 20,000 . The recently published Ireland 2040 National Development Plan 2018 – 2027 contains an objective to have at least 500,000 EVs on Irish roads by 2030. Table 1 shows the number of vehicles by taxation class and fuel type in 2017. As of the end of 2017, the majority of vehicles were powered by diesel (60%), while 39% of all vehicles used petrol. Among private cars, 2,718 or 0.1 per cent were electric. Table 1 shows that hybrid cars accounted for 29,996 or 1.5 per cent of all private cars. The number of newly licensed EV private cars increased substantially in 2017 relative to 2016 – by 80%, from 608 to 1,092. As of June 2017, there were 800 EV public charging points installed in Ireland, including 79 fast chargers 2 . As of March 2018, there are approximately 1,200 public charge points across the island of Ireland 3 . The Climate Change Advisory Council believes that the “lack of penetration of electric vehicles and other alternative fuel vehicles in the national fleet is exacerbating emissions, and an assessment of the adequacy of the current electric vehicle charging network should be undertaken 4 ” . A total of €1.8m has been allocated for charging infrastructure in 20185 . It has been acknowledged by the Commission for Regulation of Utilities (CRU) that public charging infrastructure for electric vehicles which currently provides free fuel for electric vehicles is not sustainable in the longer term, particularly as the number of EVs increases. The CRU has pointed to the need for charging infrastructure to operate on a commercial basis at a price point that does not disincentivise the uptake of electric vehicles6 . The Department of Transport has stated that an EU recommendation for one recharging point per 10 cars is unnecessary in Ireland given that home charging is currently the most common mechanism (more than 80%) for EV owners7 . Public charging infrastructure may be required in more urban environments where residents do not have access to driveways and private car parking spaces in which private chargers could be installed. Budget 2018 introduced a 0% benefit-in-kind (BIK) rate for electric vehicles8 . A comprehensive review of benefit-in-kind on vehicles is to be carried out which will inform decisions for Budget 2019. The Government is considering a new toll incentive regime to incentivise ultra-low emitting cars. An EV Home Charger Grant was launched on 1 January 2018. 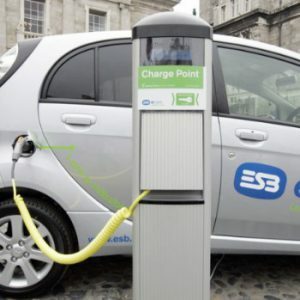 The EV Home Charger Grant scheme provides a grant of up to €600 towards the purchase and installation of a home charger unit for eligible EV drivers. The Electric Vehicle Purchase Grant, introduced in April 2011, provides grant aid of up to €5,000 towards the purchase of a new Battery Electric Vehicle (BEV) or a new Plug-in Hybrid Electric Vehicle (PHEV). From the introduction of the scheme to the end of 2017, grant support has been provided for the purchase of a total of 2,636 new vehicles at a cost of €12.4 million. Further measures which offer a firm price signal to consumers can reduce emissions, improve air quality and reduce dependence on imported fossil fuels9 . 8 Electric vehicles can avail of VRT relief of up to €5,000 and apply for a purchase grant scheme of up to €5,000. 9 At the Citizens’ Assembly, 96% of the Members recommended that the State should immediately take numerous steps to support the transition to electric vehicles. These included: developing an expanded national network of charging points, reductions in motor tax for electric vehicles (currently €120), lower or free motorway tolls. The Assembly also recommended that measures should then be introduced to progressively disincentivise the purchase of new carbon intensive vehicles such as year-on-year increases in taxes on petrol and diesel, motor tax and purchase taxes for petrol and diesel vehicles.